Today I focus on the Picnic Table and the Lily Pads as I continue my look at structures and other features proposed as part of the Inner Arbor plan. For more background see part 1, part 2, and part 3 of this series. For a good summary of the proposed features see Andrew Metcalf’s story “Breaking Down the Plan to Develop Symphony Woods” at the Columbia Patch. For more on the vision behind the Inner Arbor plan and some inspirations for its features, see the Columbia Association’s original presentation on the Inner Arbor plan. As before, my focus is on the following questions for each feature: Does it work? Is it beautiful? Will it last? What’s the cost? 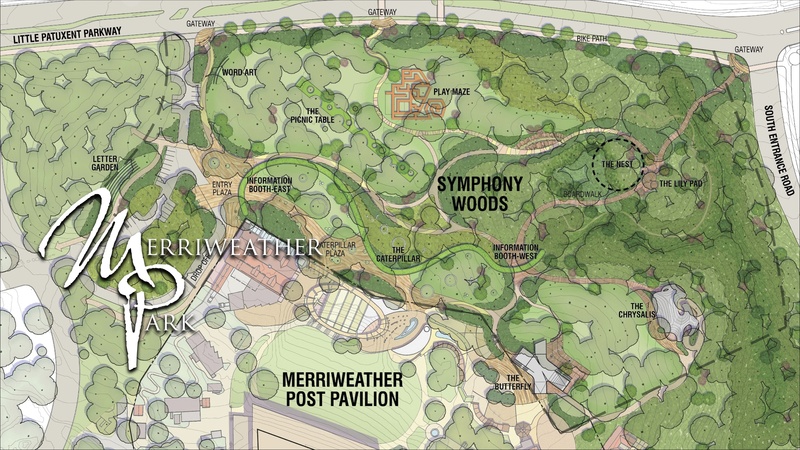 Overview of the proposed Merriweather Park, showing features proposed for Symphony Woods as part of the Inner Arbor plan. (Click for a higher-resolution version.) Image © 2013 Inner Arbor Trust; used with permission. The proposed Picnic Table feature is located near the Word Art and Play Maze features discussed in the previous post. It is a relatively long and narrow feature, and stretches across a good portion of the north central portion of Symphony Woods, running from northwest to southeast. The proposed Lily Pads feature is located near the northeast entrance to the park, the entrance closest to the existing Central Branch library. See the above graphic to get a better idea of how these features relate to the rest of the proposed Merriweather Park. The Picnic Table in Symphony Woods / Merriweather Park in the Inner Arbor plan. (Click for a higher-resolution version.) Image © 2013 Inner Arbor Trust; used with permission. The Picnic Table is a clever solution to a significant problem: On the one hand, people going to Symphony Woods are going to want someplace to sit down, stretch out, and perhaps enjoy some food and drink, especially when attending major events like Wine in the Woods. On the other hand, people would also like to be surrounded by the natural beauty of the woods in a setting more reminiscent of a primeval forest than a suburban lawn. Unfortunately, primeval forests have significant disadvantages for sitting and stretching out: The forest floor is littered with leaves, twigs, and other detritus, there are bushes and other low plants in the way, there are rocks, tree roots, and generally uneven ground to pain the sensitive rump, and the ground is often cold, damp and even muddy. The traditional solution to this problem is to provide groups of conventional picnic tables—the sort of thing you’ll find in many parks in Howard County and elsewhere, not to mention at interstate rest stops. Alternatively, there might be no picnic tables at all, with guests forced to bring their own chairs or blankets in order to be able to sit dry and comfortably. 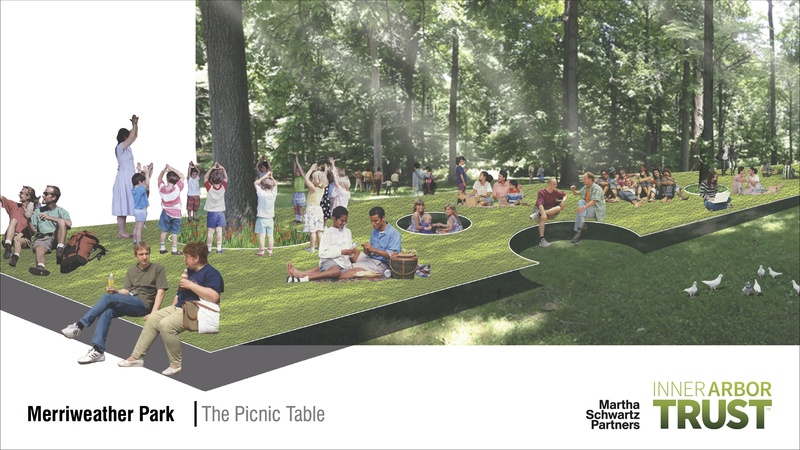 The proposed Picnic Table feature eliminates or at least minimizes the need for such ad hoc solutions, by providing what is in effect an artificial forest floor. It is elevated high enough (about 22 inches) so that people near the edge of it could sit on it as they might sit on a (backless) park bench, but not so high as to require handrails for people walking on the Picnic Table surface. People in the middle of the Picnic Table could stretch out with or without a blanket, out of contact with the dampness or muddiness of the ground. Rather than a conventional wood, metal, or concrete table surface it is covered in high-quality artificial turf. The turf would be at least semi-porous, so it might help eliminate the problem of rainwater pooling in lower-lying areas of the feature (a problem often seen with conventional surfaces). Is it a beautiful feature? No, but it would likely be more attractive than the typical park or rest stop picnic table. And in any case the use of a natural color artificial turf (as opposed to the bright green variety seen in some football stadiums) would help the feature blend in with the surrounding trees and plants. In effect the Picnic Table reverses the approach of the Cy Paumier plan: Where that plan called for a central grassy area (the Central Park Commons), essentially pushing the trees aside in favor of something like an over-sized suburban lawn, the Picnic Table keeps the trees where they are and puts a narrow simulacrum of such a lawn around and next to them—with no lawnmowing required. Will the Picnic Table prove to be durable? I think it will get a lot of use (and thus abuse), particularly during high-traffic events like Wine in the Woods. However unlike most artificial turf installations people would likely be sitting on it more than walking on it, and this may help lengthen its life. As for its potential cost, I’m not sure. If I’m understanding this Howard County Times story correctly, when Howard County deliberated in 2011 over funding conversion of grass football fields to artificial turf, the price tag was on the order of $1M per field. The Picnic Table is considerably smaller in area than a football field (about as long but much narrower), but may use higher-quality turf, requires a support structure underneath it, and would be constructed in an environmentally-sensitive area. In any case the Picnic Table almost certainly won’t be anywhere near the costliest feature proposed for the park. There have been extras proposed for it, most notably Martha Schwartz speculating at the pre-submission meeting about heating the structure so that it could remain snow-free in winter. However such extras aren’t central to the overall concept and purpose of the Picnic Table, and could be discarded or scaled back if budget concerns need to take precedence. The Lily Pads in Symphony Woods / Merriweather Park in the Inner Arbor plan. (Click for a higher-resolution version.) Image © 2013 Inner Arbor Trust; used with permission. 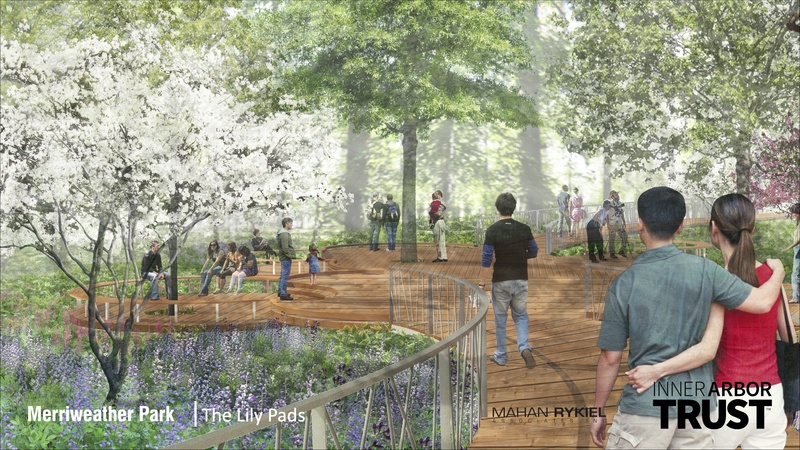 As the Word Art does at the northwest entrance to the proposed Merriweather Path, the Lily Pads serve to greet visitors arriving via the northeast entrance (for example, coming from Lake Kittamaqundi or the Central Branch library); they are a transition point into the area of Symphony Woods containing the new features proposed as part of the Inner Arbor plan. The Merriweather Park master plan (see above graphic) also shows something called “The Nest” right next to the Lily Pads. As I noted previously, this may be the “iconic interactive sculpture” referred to in CA’s original Inner Arbor presentation. If so, the Lily Pads would ultimately serve as a spot from which to view the Nest and (assuming this is allowed) to also enter it. As pictured the Lily Pads structure itself is relatively simple, almost comparable to a high-end backyard deck; its point would be to complement the Nest and not attract attention on its own. The Nest itself would be a major sculptural commission (for inspirations see the CA Inner Arbor Plan) and thus not something we’d expect to see designs for at this stage of the Inner Arbor effort. The Lily Pads are wooden platforms and walkways roughly analogous to the current walkway by Lake Kittamaqundi, as well as to boardwalks in Ocean City and other resort communities, and thus we could expect the cost and durability of the Lily Pads to be comparable to those other walkways. The Inner Arbor plan as presented appears to have a lot of wooden walkways: not just around the Lily Pads but also at the three gateways next to Little Patuxent Parkway, near the eastern entrances to Symphony Woods (the Entry Plaza in the master plan), near Merriwether Post Pavilion (the Caterpillar Plaza), and elsewhere in the park. If budget concerns grow then the pressure to economize on the use of wood will likely become intense, with critics calling for concrete and asphalt to be used instead wherever possible, My personal opinion is that this would be a false economy; the use of wood is much more compatible with the overall vision for the park. I’ll note here that communities like Ocean City with extensive wooden boardwalks have chosen to stick with wood despite the higher cost, and many have even considered upgrading to more durable (and thus more expensive) types of wood. We should look to their examples. With that I’ll conclude this post. I’ll next look at the larger and more showy structures envisioned in the Inner Arbor plan, beginning with the Caterpillar. UPDATE: Corrected the spelling of Andrew Metcalf’s name.